Cycling club Adria Mobil has organized 25th edition of the Slovenian tour and again showed & proved that it can face the hardest of challenges. This was the moment for the champagne! 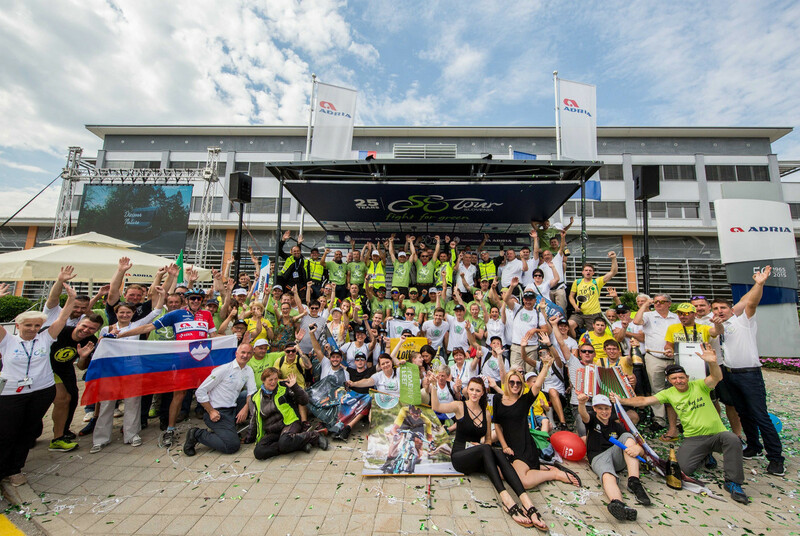 Tour of Slovenia has visited many Slovenian towns from Lendava to Novo mesto in five days, and was above all very hard organizational challenge. “I honestly congratulate and thank everybody for the amazing organization of the jubilee edition of the Tour of Slovenia. You had again proved that Cycling club Adria Mobil from Novo mesto is among the best organizers – thanks to Bogdan Fink and you all. You get a perfect ten for placing Slovenian tour side by side to all other big stage events. We’re also happy that our cycling team showed great performance in the competition of the biggest team and that Jani is again among the best. Your hard work results in promotion of the club, sponsors, cycling and our country. Than you all! I’m proud to be part of the cycling club,” said Mojca Novak, president of the OC and president od Cycling club Adria Mobil. Congratulations and thanks are coming from all sides, most precious are of course those who are coming from the side of cycling elite and their clubs. With the wishes that they will come back next year. Priceless!